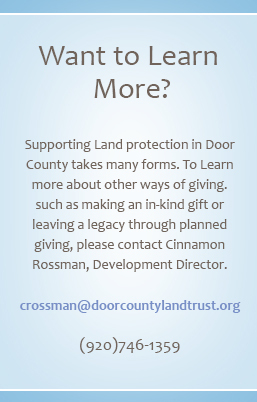 Join the Door County Land Trust today! And best of all, the satisfaction of being part of a solution to protect Door County’s most important resource…the land itself! In addition to the benefits listed above, contributors at the Northern White Cedar Society and Grand Peninsula Society levels also receive invitations to special hikes, the Breakfast in the Fields event in June, updates on the latest Land Trust news and annual gift notecards. To join, donate online or send us your membership form to make a one-time donation at the level of your choice. Each year, you will receive a letter inviting you to renew your membership. Monthly giving adds up! A small contribution each month can make a big difference. Whether you choose to donate $10 a month or $100, your contribution ensures a sustained income that helps to preserve more of this wonderful county—while helping us save on fundraising costs. You can arrange for a recurring monthly or quarterly contribution of support through a credit card charge or an electronic deduction from your checking or savings account. Begin your monthly giving today! Print a form to begin a monthly recurring gift or change your current monthly giving. How can I begin monthly giving? Visit our online donation page. Enter the amount you choose to donate each month. Choose “Monthly” for your donation frequency, and each month your contribution will be automatically withdrawn. Without a canceled check, how can I prove I made my payment? Your bank/credit card statement gives you an itemized list of payments. It is your proof of payment. The Door County Land Trust will send you an annual receipt, each January, which shows that your contributions are tax-deductible. What if I change bank accounts or credit card numbers? 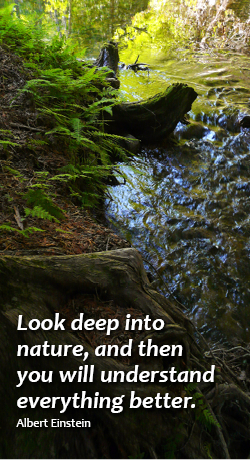 Notify the Land Trust and we will send you a new authorization form to complete. How much does electronic payment cost? It costs you nothing. And, you save the cost of stamps, checks and envelopes. Recurring credit card payments cost no more in fees than other credit card charges. What if I try recurring electronic payment or credit card payment and want to cancel or change my payments? You may cancel your authorization, change the frequency of the payments or change the amount of the payments by notifying us any time.